An idea that came from leftovers. One Sunday I had some friends over and I made a steak and salad for dinner – I cooked too much steak, so I had leftovers. The day after I ate the steak and salad, and REALLY loved it, almost more than when it was fresh. There’s something about left over steak. The flavour is different, the bite is a little more firm from the fats being solid again. I felt the flavour of it was very nostalgic of eating roast beef sandwiches from leftovers after a big family dinner. And so that is the whole story behind this dish – leftovers garnished with sandwich ingredients. The steak was cooked medium rare, then cooled overnight. Garlic and thyme bread crumbs, mustard cream using Kozliks horseradish mustard, triple crunch mustard, pickled and seared onions, crisp enoki mushrooms, caramelized onion puree. 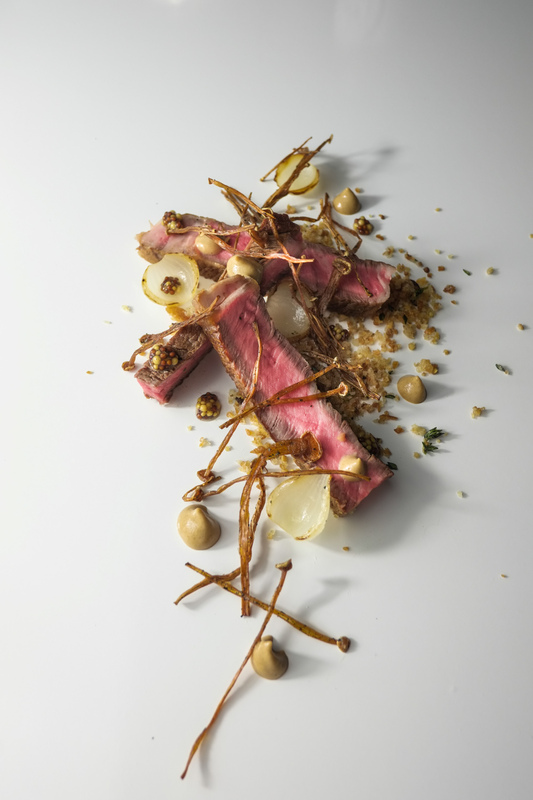 “And each one of them also aspired to the virtues of every good haiku: naturalness, subtlety, austerity and simplicity” – taken from the book Mugaritz. 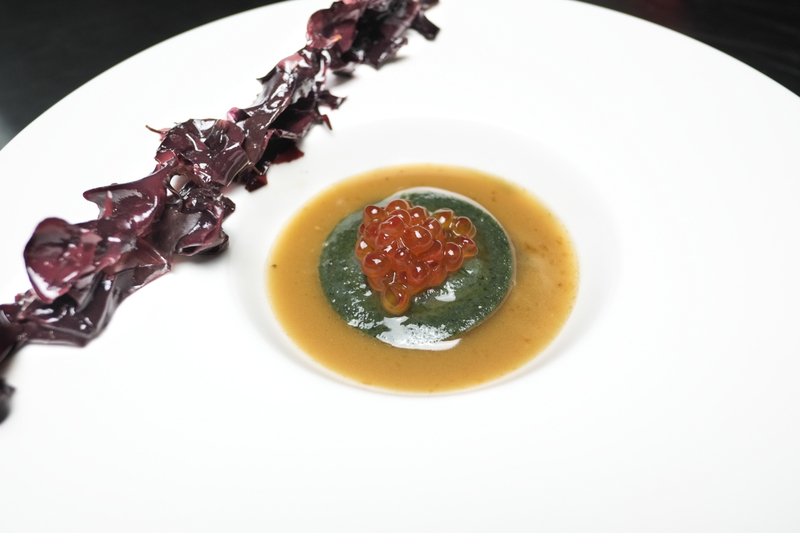 A few weeks ago, everyone was excited about the new list of The World’s 50 Best Restaurants. That list came out Monday, the 28th. 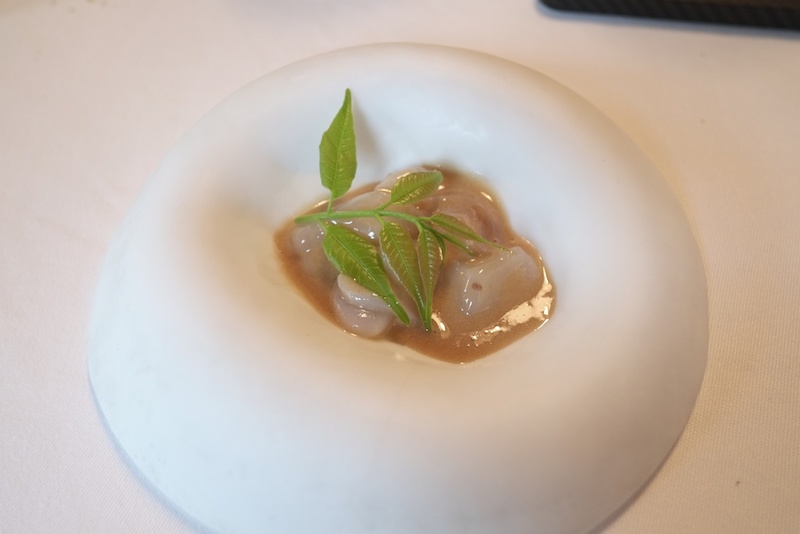 While I was aware of this list, I cared more for something else – the meal I was about to have in Mugaritz just a few days before the release of said list. This meal was perhaps my most anticipated this year. I’ve been wanting to go for a while. I’ve read the book, and before I knew it I was already in love with the restaurant and the idea of it. In a away, it had me divided. I’ve been to many restaurants where dishes have over 7 components, and I thought those were incredible – complex plating styles, incredible works of art just to see. And then I read the book Mugaritz. I thought “wow, this was something I’ve been thinking about, making things as simple as possible, in one profound bite.” I’ve held a philosophy that the simplest things require the most amount of thought. Their philosophy seemed to coincide with mine. Needless to say, the restaurant and the meal did not disappoint. I had a wonderful and profound experience. I also experienced something surreal, the mortal and pestle course. A friend of mine already told me about this course. It’s a certain time of the meal where the whole dining room gets the same course. This time, they called the course “Linking…dip of fried bacon and saffron, cornbread”. Despite hearing about this beforehand, it was still surreal just to experience it, to see the entire dining room engaged in the same activity. I took very little photos of the course. To be honest, I was completely engulfed in the moment. I wanted to fully experience that moment unhindered and uninterrupted by any attempts at documenting it. Well, almost. I still took one, haha. Anyway, I’ll have to abruptly end my tirade there, otherwise I’ll just go on and on. So here are some photos. A dozen smeared radishes. We were instructed to only eat the radishes. The grass underneath was then part of a later course. The dining room during the mortal and pestle course. Notice the majority of guests standing up.